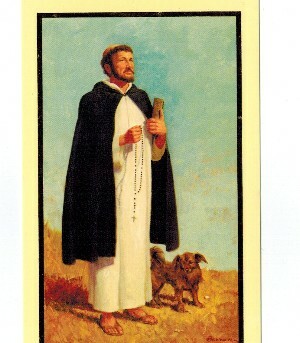 paper card stock prayer on back: Prayer to St. Dominic Great Saint Dominic, you labored for the salvation of others by preaching the Word of God in dangerous times, even among the heretics. Inspire me to be like you. Let me be strong in my faith. Help me to provide for the needs of the children of this world. Lead me to spend my days as a reflection of Christ's love throughout my life. Give me the right words to always speak the truth with a zeal for saving souls. Amen. Feast Day: August 8th size: 4"by3"